Logan Lerman (Noah) has come a long way from portraying a teenage hero in the Percy Jackson and the Olympians franchise. He proved his acting abilities in the David Ayer war film Fury and now takes a central role in director James Schamus’s film Indignation based upon the novel by the Pulitzer Prize winning author Phillip Roth. Roth’s novels are notoriously difficult to be adapted to the big screen. One of Philip Roth’s novel’s The Human Stain was adapted into a provocative 2003 Robert Benson film starring Anthony Hopkins, Nicole Kidman and Wentworth Miller. Roth’s outstanding novel American Pastoral has recently been made into a film starring Ewan McGregor, Jennifer Connelly and Dakota Fanning. Schamus does a sterling job of bringing Indignation to the big screen and Loman is nuanced and brilliant as the seriously conflicted young Jewish freshman Marcus who has a crisis of faith while attending a conservative Ohio college which forces the students to attend mass every Sunday. Religious disaffection, sexual repression and social pressure are all perfectly framed within the 1950’s Korean War where young American serviceman were being conscripted to fight in the first of many US led foreign wars against the Communists. At college Marcus while working in the library is attracted to the gorgeous Olivia Hutton who is not only sexually provocative but also slightly mentally unstable. On their first date Olivia performs a then unspeakable sexual act on Marcus, which releases years of pent up repression and rage. Marcus fights with his roommates and soon requests a transfer which comes to the attention of Dean Caudwell wonderfully played by Tracy Letts (The Big Short). The religious conflict is evident when Marcus tells Caudwell that he is happily atheist, even though he was brought up in a Jewish home and worked for his overbearing father in a kosher butchery back in suburban New Jersey. When Marcus falls ill, his sympathetic mother Esther Messner wonderfully played by Linda Emond (Julie and Julia, Oldboy) comes to visit and soon meets the illustrious Olivia. In the emotional crux of the film, Marcus makes a deal with his mother to stop seeing the clearly damaged Olivia superbly played by Canadian actress Sarah Gadon (Cosmopolis, A Royal Night Out). This arrangement along with Marcus’s continued conflict with Dean Caudwell on religious grounds has disastrous effects. Much to Caudwell’s horror, Marcus even quotes from the philosopher Bertrand Russell in his defence of atheism and his anti-establishment viewpoints. 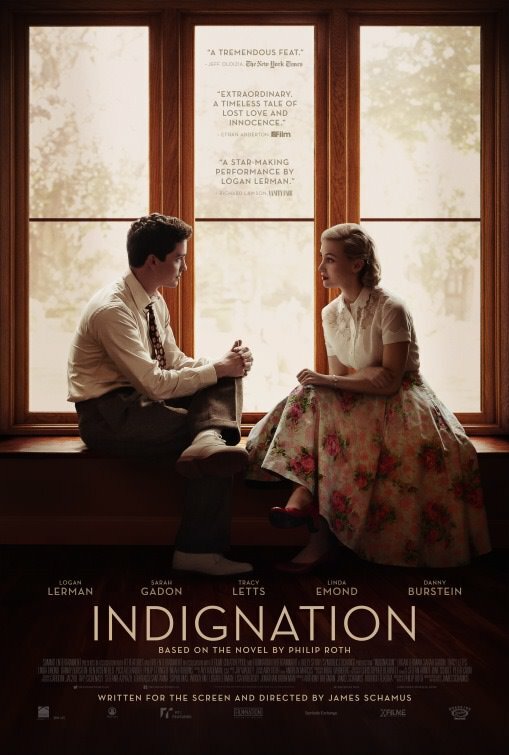 Indignation is an intelligent exploration of one young man’s coming of age and his ultimate spiritual sacrifice on the cusp of what could have been an illustrious future. Logan Lerman and Sarah Gadon hold their own in Schamus’s tightly controlled script based on Roth’s novel. This atmospheric period drama is recommended viewing for those viewers that like their cinema thought-provoking, but ultimately Indignation does justice to Roth’s complex literary aesthetic.